The famous 1927 "Bustin' Babes" and "Larrupin' Lou's" postseason barnstorming tour was the most popular postseason barnstorming event in baseball history, playing to capacity crowds at each stop in cities throughout the country desperate to see the game’s most legendary slugging duo. The overwhelming response by the public was so favorable that it led them to repeat the tour in 1928. 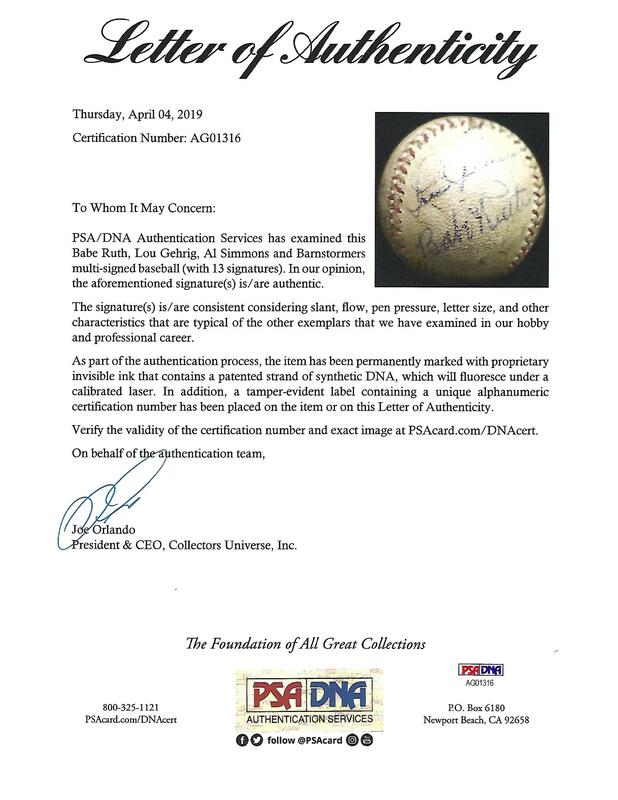 The offered “Harwood’s National League” baseball is signed by Hall of Famers Babe Ruth, Lou Gehrig and Al Simmons, as well as fellow big leaguer Joe Hauser and a slew of other players who were likely the best local talent the city of the ball’s origin could muster. The ball’s rare and most significant feature is Ruth and Gehrig appearing together on the same panel, positioned perfectly for maximum display. Their signatures rate about 6/10 and the ball is evenly toned and soiled most likely from game use. The Simmons autograph rates 7/10 with the balance of the 13 total autographs averaging 6/10. Full LOA from PSA/DNA.